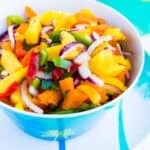 Mango salad – This Belizean inspired raw mango salad is perfect for summer and the ginger lime dressing really enhances the flavour of the fruit. The weather is gorgeous in the UK right and it is predicted to soar within the next few days. I’m not complaining as the summer season is my favourite time of the year. Although the UK is not known for its warm and sunny weather, residents whom are used to the erratic period have good reason to appreciate this lovely weather. 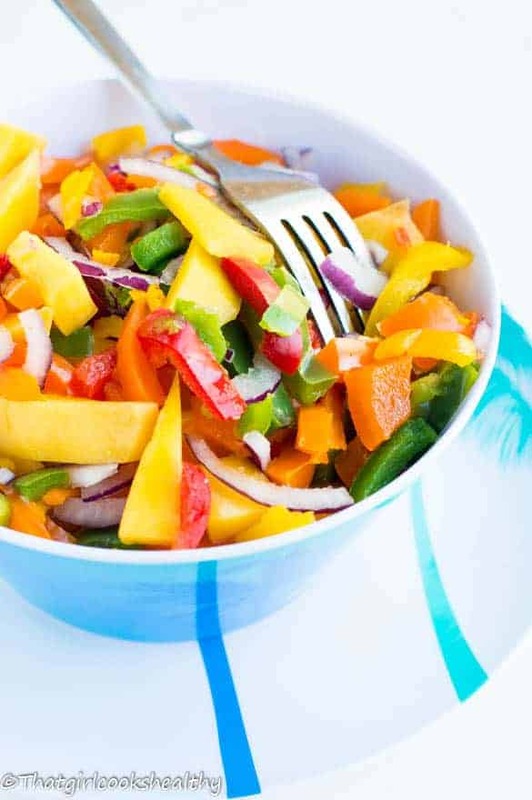 Anyway, salad bowls have been on the agenda for moi, more importantly a good mango salad recipe is what I’ve been drawn to lately. It’s so easy to obtain tropical fruits during this time of year, especially if you live in a diverse city like I do. 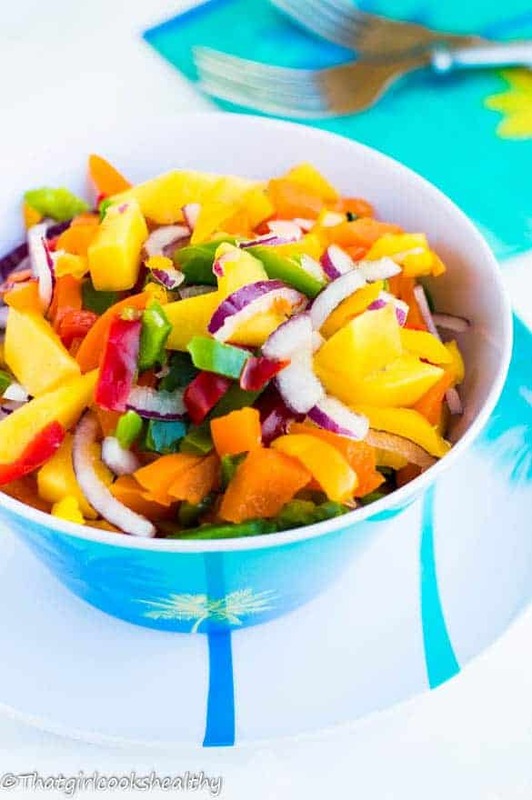 This mango salad was Belizean inspired, I liked the idea of pairing some fresh mangoes with bell peppers – red bell peppers add a great sweet crunchy taste along with the star of the show, the mango. Thankfully this decadent salad is a perfect low carbohydrate option for weight watchers. 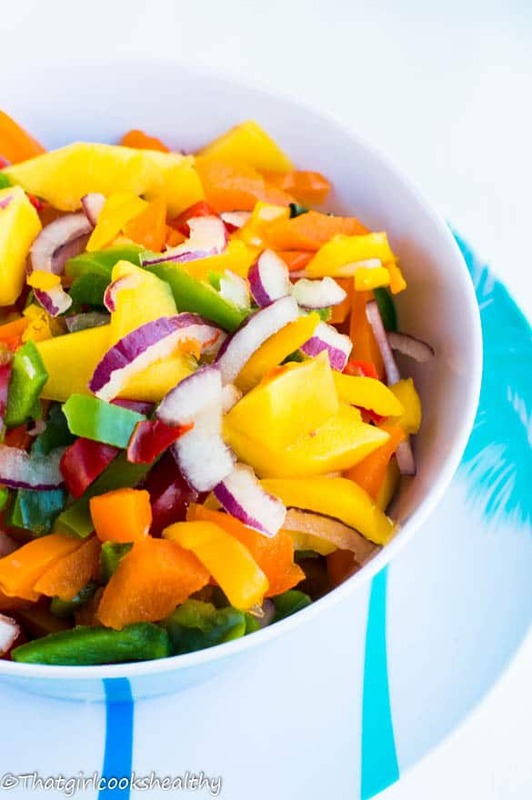 It’s high in vitamin c from the mango, bell peppers and I successfully created an anti-inflammatory dressing salad using lime, ginger and other condiments. Definitely a winner to boast white blood cells which strengthen the immune system and also helps to remedy joint pain. Charlene, this salad sounds absolutely delicious and looks beautiful! I love mango and am glad to have one more recipe to use it in. It pairs so well with many things. I also like to make a salad with mango and avocado. Your salad recipe looks like another winner! Thank you for the recipe and for the inspiration. I hope you do indeed manage to create this wonderful recipe.